Record and watch your favourites at will with the largest HD recording capacity 150 hours. Plus, you can set recordings easily from your TV or anywhere, with the exclusive Satellite TV remote PVR app. Bell TV 9500 HD PVR High Definition / Personal Video Recorder Satellite Receiver + Free HDMI Cable! The Bell 9400 HD PVR Plus serve's up your television entertainment your way! Record your favourite shows from anywhere, see what's on 9 days in advance, and access stunning On-Demand 1080p HD movies on your HDTV. Never miss a minute of the action! Need to step out for a bathroom break? No problem. The 60-minute buffer with recording capability allows you to pause and rewind live TV, plus the dual tuner lets you watch a recorded show while you record 2 more. Watch top movies and shows in HD of up to 1080p. 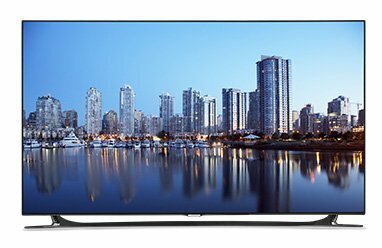 The 9400 HD PVR Plus displays your TVs and movies the way they were meant to be seen in widescreen picture with 10x the resolution of regular cable. Not only will your home theatre experience look amazing, but it will sound amazing too courtesy of Dolby® Digital 5.1 surround sound. You'll hear every delicate whisper, spine-tingling creak and heart-pounding blast! See the whole picture as it was originally filmed. Many movies and TV shows have to be reformatted and cut to fit a regular TV screen ? not anymore. Featuring the very latest HDMI technology, our receivers offer greater compatibility with even the most recent HD TVs and home theatre equipment. Choose between 720p and 1080i HD resolutions. Thanks to cutting-edge technology and rock-solid hard drives in the Bell TV HD PVR, you don't have to miss a minute of the action. Record one show while you watch another live show. The versatile Bell TV 9400 PVR receiver also allows you to pause and rewind; simply connect an external hard drive to turn it into a PVR. 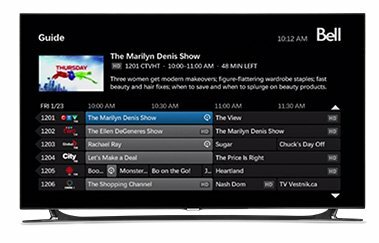 Bell TV receivers feature the most advanced onscreen guide. View an evening's worth of programming at a glance and see what's coming on up to 9 days from now. Do I need both satellite input cables hooked up on the back? Yes. With All PVR's they need both sat-inputs on the back of the box to be filled. If you have a legacy D-Type LNB system, this means two full runs of cable from the dish or switch to the receiver. If you have a DPP LNB system, you can run one cable from the LNB or switch, then use a DPP seperator at the receiver. Does the HDPVR9400 run two receivers? Do you sell the 9242? The Bell 9400 PVR only works with 1 TV. The 9242 has been discontiuned for a number of years. Yes you do, however, with a DPP LNB and DPP Separator, you can do this by running just one cable to the back of the reciever. How many HDMI outputs does it have? There is one HDMI output. Do I require an external hard drive to record and playback programs? The Bell 9400 comes with a built in hard drive that can record up to 150 hours in HD.